If you happen to be in the area don`t miss this fun, local event in Kurokawa Onsen! This year,the Kurokawa Onsen Kanshasai or `Onsen Thanksgiving Festival` will take place as usual over the weekend of October 1st and 2nd. Starting from 3pm on october 1st there will be a variety of food stalls,games,displays and events ,mostly located in the car park of the Visitor Center. 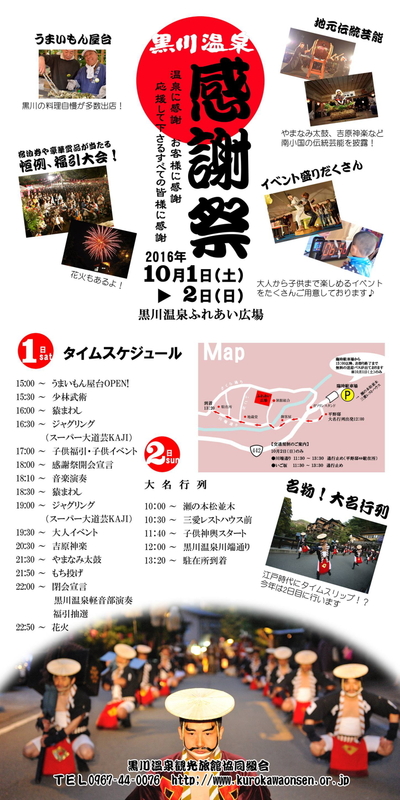 There will be lottery tickets on sale,and the draw (prizes last year included Kurokawa Onsen accommodation coupons) will take place at 10pm on the main stage,followed by fireworks. On Sunday October 2nd there will be a colourful parade advertsised as an `Edo period time slip` starting from the San-ai Rest House around 10:30am,proceeding down into the streets of central Kurokawa and then back. Please be prepared for traffic congestion,with some streets (mainly Shimokawabata and Kamikawabata dori) closed to traffic between 11:30am and 1:30pm. During the weekend of the festival there will be extra parking available just further along route 442 (keep going past the Gas Station,through the tunnel and it will be signposted on the right) with a shuttle bus provided. Events start from around 3pm and end later than usual this year at 11pm,with fireworks. If you are driving,be prepared for some road closures or diversions downtown,especially during the evening parade.